• At our school, students are required to wear a helmet and a "bouffant" cap under their helmet. The "bouffant" caps help keep the helmets more sanitary. • Students are issued one bouffant cap. You can purchase them (100 for about $5) on-line from Uline here. • The students write their name and hour of PE on the bouffant cap. They keep it in their lockers for the entire unit. • Students needing a new bouffant can purchase one from us for 10 cents. • Allowing your students to bring a baseball cap from home and allowing them to wear the cap backwards under their helmet. • Large, commercial-grade, disposable paper coffee filters that students can wear under their helmet. You can purchase these in bulk at a warehouse club or on-line from Amazon (1,000 for $12) here. • All of the separate types of gear and sizes are stored in their own individual laundry baskets. As of 2015, all new protective gear in the Skate in School program comes with color-coded stitching for the different sizes. We then color code the laundry baskets to match. Airing out the equipment is important because equipment gets damp from use and the laundry baskets are ideal for allowing them to dry. • At the end of the day we spray Lysol into the container, mix it up, and repeat. We then let them dry out inside the laundry baskets. • Some students are squeamish about wearing sweaty gear. We let them wear their long pants and long sleeves if they wish. I have also told some they could wear a light pair of gloves under the wrist guards. • Absolute control on how the students return gear is essential. If not, you will become very frustrated at what you have to do to fix things for the next class. 1. Five minutes before class ends, all students sit down and begin taking off gear in a specific order. 2. Wrist guards, helmet, elbow, knee, skates. If I don't do it in this order, there is disorder. It is difficult to remove other equipment with wrist guards on so they come off first. 3. It is essential that they Velcro the tabs back onto the Velcro teeth or it all gets stuck together in the container. 4. 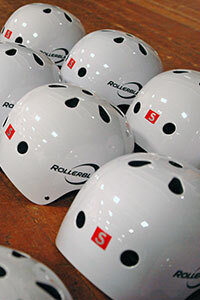 Students then have to stack their safety gear in their helmet as follows: knees, elbow, and wrist guards. They should be stacked in a neat pile. The next step is to leave their skates on the floor and present their pile of gear to me. I observe it and look for all items to have Velcro secured. I then tap it as their "ok" to begin returning it to the correct size and color coded laundry basket. 5. The student re-clips the helmet, returns it to the cart, then goes back to get his/her skates. 6. Finally, the student returns the skates to the correct location on the cart where they had placed their shoes. The skates are paired either paired in a row or side by side. All new Spiritblade RTL skates in the Skate in School program have the sizes already on the back of the skate. For the youth, adjustable skates, you can use a permanent marker. This is done two times a year. Equipment is cleaned at the end of 12 weeks of use and once during the 12 weeks. 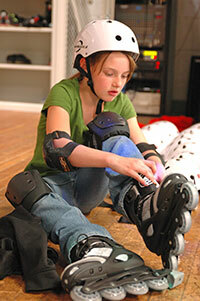 Lysol use on safety gear and skates is daily. 1. Remove all of the foam Velcro removable tabs inside of the helmet. Put them in a secure laundry bag and place it in the washer. Set dryer on air dry. 2. I do this next step in the custodial area because it has a big floor grate drain area. I have also done it in the shower rooms). Fill two large plastic containers with water. One has laundry detergent in it; the other has plain water. I place the helmets in the soapy bucket. I take a towel and wash each helmet. When I am finished cleaning all of the helmets, I use the custodian's water hose to rinse them all down again (this can also be done in the shower room). Then I put the helmets in our storage area to dry. 3. When it is time to replace the foam Velcro tabs, I have the students do this on one of the first days of equipment use. Note: This is my method, not a manufacturer recommended method. Although this method produces additional wear on equipment and may cause damage, we do it to save the time that hand washing would take. 1.It is very important to have all of the Velcro gear secured into all of the exposed Velcro teeth. All gear should be secured as if they were being worn. 2.The gear is then sorted into like sizes and type: elbow, knee and wrist guard. I do each load separately to save time for later reorganization. 3. Using a front end loading machine on cold and gentle cycle, I let the machine do the work. You can also fast forward the machine so as not to agitate too much. 4. When removing the gear, you may let them air dry or use a dryer that has air and cool cycle. I have been drying mine in a dryer. You must make sure that all the straps are secure again before you dry them in the dryer. If you do not make sure the straps are secure, you will have a tangled mess. 5. An alternative to dryer use is line drying the gear outside or inside. Whenever I can, I use student assistants and check their work completely.